Keeping It Light During these Gloriously Longer Days! It seems it is just so much easier to eat lighter when there is such an abundance of the wonderfully fresh produce that summer provides. The heavy stews and sauces of winter are long gone and we are left with green, leafy vegetables and ripe plump fruit that simply cry's out for us to eat healthier! That's always my plan anyway. (Well, at least it is now!) So, before the Hallmark Channel starts running Christmas movies, I plan to recharge (and reshape) my body with some great taste and some oh, so good for you food! 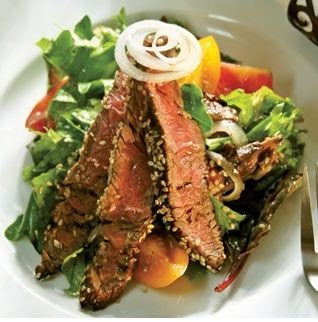 The best part is, I recently found a salad recipe that brings together my two favorite flavors; steak and Asian infused anything! I have been in to making stir fry at least once a week, and always make enough for two meals. Homemade Asian-style food is so much healthier than the take-out variety, and I've learned so much in my research of this culinary culture. Example - if any recipe calls for rice vinegar, try not to substitute. Its flavor adds so much Asian influence that standard white vinegar simply doesn't work. And, toasting sesame seeds will enhance the flavor with a rich nuttiness, a step that just can't be missed. The recipe below, uses both of these ingredients, and you will be so glad that you added it to your list of healthy summer dinner choices! 3. Grill steak on preheated grill until firm, reddish-pink, and juicy in the center, about 6 minutes per side. Transfer steak to a platter, sprinkle with lemon juice, and cover loosely with aluminum foil. Allow meat to rest for about 10 minutes, then cut into strips. 4. Whisk rice vinegar, olive oil, sugar, sesame oil, garlic powder, and red pepper flakes together in a small bowl. Combine lettuce, cucumber, avocado, tomato, carrot, red onion, and steak strips in a large bowl. Pour rice vinegar dressing over salad and toss to coat. Sprinkle with sesame seeds to serve. I must admit, I do not like avocado and simply leave it out of this recipe. I know it's healthy for you and I so wish I liked it, but I don't. So, in it's place. I add mushrooms, which I can eat with almost anything. Living single can lead to so many nights of eating out, that I've picked up a few pounds. Now, I'm striving to not "diet", which always includes some type of deprivation, but rather to adopt a healthier and lighter lifestyle. And that is incredibly easy this time of year. My only demand in eating healthier, is flavor, I won't deny myself that, and will search hard and long for recipes that satisfy that requirement. I was recently in Cincinnati where I visited a spice shop with my nephew who also loves to cook. In today's markets, there are such a variety of seasonings and salts that weren't available years ago. And if you don't explore, your missing out on some great flavorings! I bought some mesquite-flavored sea salt that I actually sprinkle lightly on the steak in this recipe before grilling. And since I stove-top grill, it's almost a necessity to achieve that outdoor taste. I am excited to venture on this healthy journey and will definitely share what I pick up along the way. Stay with me, we have a whole summer of good eats! Ahh...wish this was a "scratch & sniff" blog! I have mentioned my Italian Grandmother several times in Kitchen Clatter but I very rarely mention my Grandfather. It's most likely because they were separated most of my life, so, I didn't see him much and we really didn't have a relationship. But, something I saw him do once, stays with me now, decades later. You see, I have a clear vision in my head of my Grandfather sitting at the kitchen table on a warm morning with crisp white curtains blowing near by. He was slicing a lemon into wedges, dousing the sections with salt, then popping them in his mouth. Born and raised in Italy, he struggled with the English language, but saw me standing in the doorway and motioned for me to come over. He cut the fragrant citrus into quarters and handed one to me along with the salt shaker. Ever since, I've been hooked. Lemons and salt are perfect together! There. I used the "S" word that everyone is trying so hard to avoid! Now of course this was way before we were concerned about our daily sodium intake, but I must admit that even now, I've been known to remove the lemon from the bottom of a Bloody Mary, add a sprinkle of salt, bite down and reflect on that summer morning so many, many years ago. In my family, I've always been known for my Italian salad dressing, not sure why, it's simple enough. But whenever there is a family gathering, I'm asked to make the dressing, which is 1/4 cup of oil, 2 tablespoons of red wine vinegar, a squeeze of lemon, salt and pepper. The one thing I will do that may be different from most homemade dressings is, before I add a tomato into the salad, I squeeze the juice into the dressing and then whisk. Now, when I am making a salad just for myself, I eliminate the vinegar completely and use the juice from half a lemon and add a little garlic salt to the extra virgin olive oil. Perfect! That being said, I found a recipe for a salad last year that I simply fell in love with. 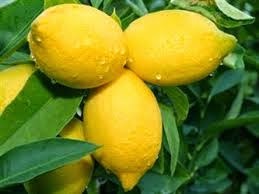 It also uses olive oil and the acid from a lemon instead of vinegar. 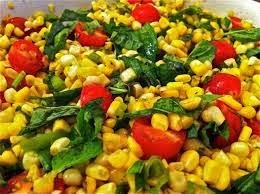 And with corn and tomatoes coming into season, this is a must try, good to the last bite salad that, if there should be leftovers, keeps well for a few days! It's only mid-June and I've already made this three times! 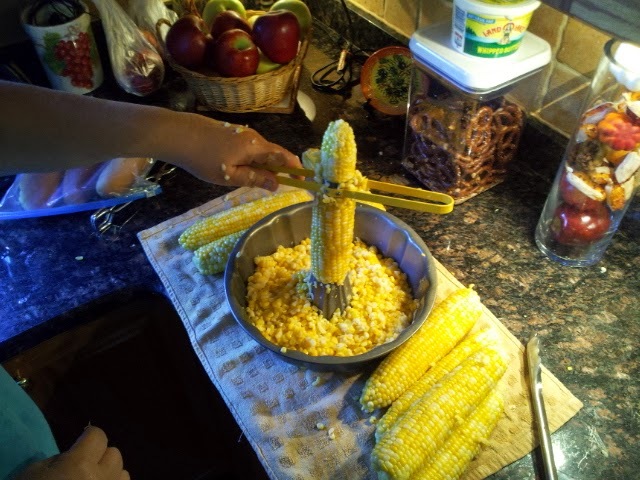 Best way to remove corn from cob is using a Bundt style pan! Rub corn with 2 tablespoons of canola oil and season with salt and pepper. Grill or broil corn for 7 minutes or until ears are lightly browned. Remove from grill and allow to cool. Remove the kernels from the cob and place in a large mixing bowl along with the cherry tomatoes, red pepper, scallions, and arugula. Toss the salad with the dressing and serve at room temperature. (Since room temperature is key to fully tasting all of the ingredients, I do not add the arugula until I am almost ready to serve). So go ahead and make this salad! See if you don't agree that this is the sweetest, crispiest, lemony (not sure that's a word, but we'll go with it) salad you've ever tasted! With Jersey corn and tomatoes, and no refrigeration needed, this would be a perfect Fourth of July addition to the menu! Crisp corn, sweet tomatoes, salty lemons! It's all there! Last week, we lost someone whose words have seen me through so much rough terrain. Whose words have mellowed me, comforted me, and mentored me. It should be known that I'm a closet poet. I read it. Write it. Love it. I'm addicted to the rhythm and the rhymes and it is what first attracted me to the mind and soul of Maya Angelou. From first learning of the anguish and pride of the caged bird singing, to her reciting of "Pulse of the Morning" in 1993, at President Clinton's inauguration. She had me at "Good Morning", the last line of the poem that encouraged us to greet each day with tolerance, love and faith. I immediately starting reading any and everything she wrote. Raped as a young child she made the decision not to talk after the man she accused was found murdered. She believed her words killed him. She didn't talk for five full years. Not a word. When a teacher finally broke through the barrier and encouraged her to communicate again, her words flowed with force and the compassion of someone who quietly observed the world around her for so many silent days. "Courage is the most important of all the virtues because without courage, you can't practice any other virtue consistently." Life itself is all about having the courage to make it through any day. In past months, I remembered that quote on each day that it took everything I had to put one foot in front of the other. It kept me moving. Dr. Angelou was a freedom fighter who worked along side of Malcolm X and well knew the courage needed to change the world one day at a time. It takes courage to have conviction. Courage to have faith. Courage to take the first step when you can't see past the next one. It is this quote that has defined my life. It hangs over my desk at the office, and stays on the screen of my laptop at home. Her words stack like a monument that points me in the right direction each and every time I feel a little lost. I WILL NOT ALLOW the actions of someone else to make me anything less than I am. Because of her words, in someone else's loss, I gained myself. I will be forever grateful, Ms Angelou, for that lesson. I will remember it always and pass it forward on every given opportunity. Oh baby! How I strive to accomplish that mission! It is all the essentials of a worth-full existence. A life well-lived! Stamp it on my tombstone and let it be my legacy! 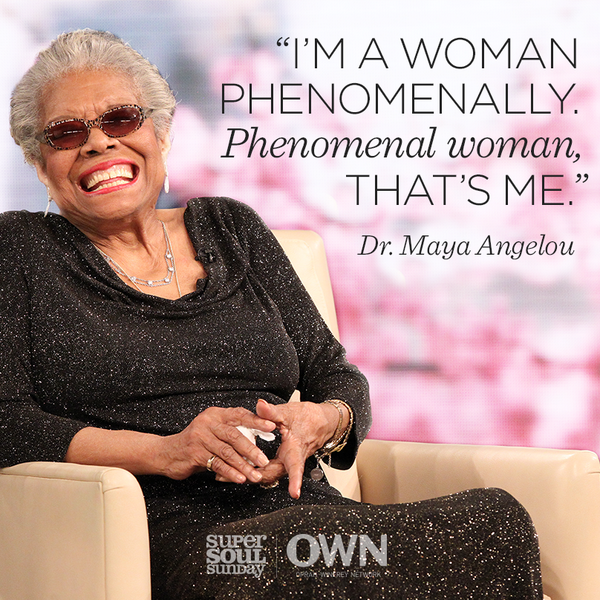 Maya Angelou inspired me on so many levels throughout the years that I felt her loss deeply last week. For so many years, I have surrounded myself daily with her visions. It was so wonderful to hear and see her words celebrated in the media and social masses last week. Even I, a long time admire, found things I hadn't seen before. I may even have a new favorite, one the celebrates the imperfection in all of us. "Every day I try to do better. See better. Say better. Talk better. Be better. I do my best. And I blow it 10 times out of 12. I ask forgiveness of anyone whose feelings I may have hurt. I ask forgiveness of God. I forgive myself. And then I start again."